As Americans have been learning in recent weeks, Russia sometimes has its own way of describing events—like when Vladimir Putin claimed on March 4, despite the presence of Russian troops on the ground, that he hadn’t invaded the Crimean region of east Ukraine. Then there’s the narrative about what is spoken in that invaded country: namely, the Ukrainian language. The claim that Ukrainian isn’t a language has been one of the drumbeats of the Russian-Ukrainian relationship for centuries. It’s true that the distinction between a language and a dialect is notoriously slippery, often more about politics than mutual intelligibility or shared vocabulary. As Yiddish linguist Max Weinreich famously quoted, “A language is a dialect with an army and a navy.” But according to linguists outside of Russia, Ukrainian and Russian are two distinct, if closely related, languages. The attacks on the status of Ukrainian, in that light, offer a window onto a side of the conflict that can be hard for outsiders to grasp: the persistent ways that Russia has taken advantage of a long and complicated cultural relationship to enforce its claim to power. In the West, it’s generally agreed that Ukrainian and Russian are separate languages, with 38 percent of their lexicon differing. (That’s slightly more than Spanish and Italian, which differ by 33 percent.) It’s also generally agreed that the three Eastern Slavic languages—Russian, Ukrainian, and Belarusian—split off from Old East Slavic about a thousand years ago. Some Russian linguists, however, tell the story differently: They claim that the East Slavic ancestor was in fact a form of Russian, making Russian not a sibling, but rather the mother tongue from which the other languages descended. The word for Old East Slavic in Russian is drevnerusskiy yazyk, which means “Old Russian,” whereas Ukrainians call it the more neutral davn’orus’ka mova, or language of Rus, the medieval Russian state. Russian attempts to ban Ukrainian in its imperial territories didn’t end with the Valuev Circular—in 1876, Czar Alexander II issued the Ems Ukaz, banning the public use of Ukrainian altogether. Ukrainian scholars will remind you, meanwhile, that 17th-century Russia, having mostly missed out on the Renaissance, was still catching up to modernity. It relied on Poland and Ukraine, with their connections to Europe and European languages, to broaden its vocabulary: “The Russian language was borrowing many constructions and forms...[from] the Ukrainians, because at that time [Russia] was underdeveloped compared with the Polish-Lithuanian Commonwealth and Ukraine,” said Andriy Danylenko, a Ukrainian linguist at Pace University. Ukrainian also saw a cultural revival in the 19th century, a Romantic outpouring of literature, journalism, and folk traditions that built the fundament of a new nationalist identity. In this light, the imperial Russian decrees against Ukrainian suggest the language was seen less as a poor stepchild than as a rival. The ban on Ukrainian was lifted after the first Russian Revolution in 1905, and after the second Revolution, Lenin and Stalin at first oversaw a period of Ukrainization, when the language was first standardized and dictionaries were written. During this time, according to Myroslav Shkandrij’s book “Russia and Ukraine: Literature and the Discourse of Empire from Napoleonic to Postcolonial Times,” some Russians viewed Ukrainian with a patronizing admiration, as a rural, archaic proto-Russian, a folk language at a time when the folk were meant to rule. One writer even suggested that elements of it be grafted onto Russian to make Russian more “pristine.” But the perils of their condescending attitude became quickly manifest in the late 1920s and 1930s, when Stalin began to enforce Russification on the language again, rewriting dictionaries to impose Russian loan words just as he purged the Ukrainian intelligentsia. The Ukrainian spoken today, nearly 25 years after it was first declared the country’s official language at independence, still bears scars from centuries of linguistic and demographic oppression. Although some intellectuals would like to bring back the old Ukrainian words banned by Stalin’s linguists, it’s difficult to undo the common parlance of eight decades. Most of the country is bilingual; many who check a “Ukrainian” or “Russian” census box are still fluent, often from birth, in the other language. But the years of Soviet rule created a linguistic hierarchy, in which Russian became the language of economic and social mobility, while Ukrainian was still considered a rural language. Pressure to speak Russian produced hybrid forms, known as surzhyk, close to Ukrainian grammatically but with Russian vocabulary and endings, now spoken by many Ukrainians as a private language. “Some writers have said [speaking surzhyk] is like getting home and putting on a comfortable bathrobe and slippers,” said Michael Flier, a Ukrainian philologist at Harvard. Ukrainian and Russian are today closer than they were a hundred years ago due to Soviet Russification, and somewhat mutually intelligible—speakers in Ukraine often switch back and forth from one to the other. Flier told me that many Russians claim they understand Ukrainian, partly as a way of demoting it to dialect status. But, he pointed out, when Victor Yuschenko was prime minister and insisted on speaking Ukrainian to Vladimir Putin, Putin needed a translator to understand. 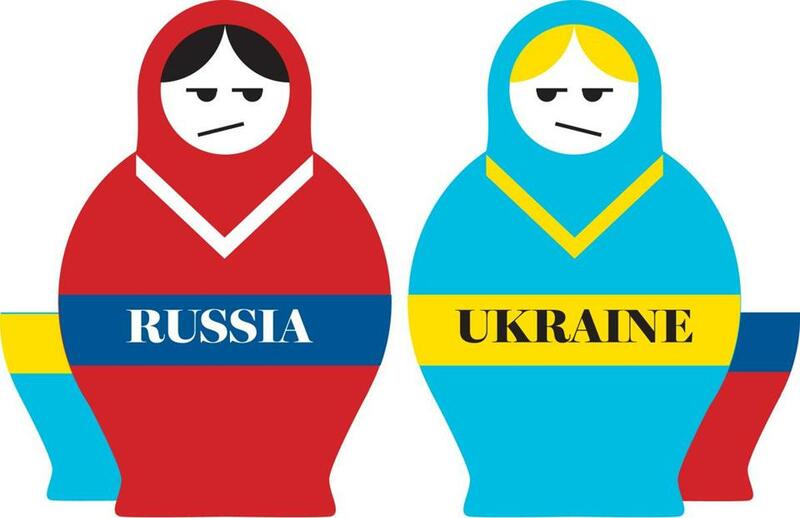 Over the past two weeks, the Russian government has appeared to exercise selective vision about the separateness of the two languages, in that it does seem to see Russian as distinct enough from Ukrainian to need defending. In February, when the new Ukrainian Parliament abruptly vetoed legislation that had granted Russian official-language status in many parts of the country, Putin was quick to claim discrimination. In fact, the charge that Russian-speakers in the Crimea were under threat was a prime excuse for the invasion. Like much in Russia’s long narrative of Ukrainian, it was more useful fiction than linguistic reality.